Okay, I've previously written about the Adventure Games (or interactive fiction) that I enjoyed in my youth, however the next step on from these games was what I knew of as The Computer Roleplaying Game (CRPGs). Okay, these days they are referred to as Roleplaying Video-Games, but the thing is that I'm incredibly old-school (as is indicated by the fact that I still used the term Adventure Game) so keeping with that I'll simply refer to them as CRPGs (particularly since Roleplaying Video Games sort of conjures up a different image in my mind). Like adventure games, the computer roleplaying game found it's origins in Dungeons and Dragons (which in turn had evolved from the war game, though it had also been influenced by the world of Tolkien, among others). Like the adventure game, people where looking for ways to be able to experience roleplaying without having to bring people together on a Saturday night (or at least to be able to play outside of the game times). Obviously, in the early days there were severe limits as to what sort of experience this games could provide, however they did eventually lay the foundations of the Warcraft and what not of today. Honestly, CRPGs are probably as old as adventure games, though I would suspect that since adventure games tend to be a little simpler then they are probably a lot older (though Wikipedia does indicate that they began to appear in the mid to late 70s, which is about the time that Colossal Cave appeared). In my mind the difference between an adventure game and a CRPG was that in a CRPG you could create a character with stats, and also fight monsters in a way that didn't involve finding the item that you could use to kill them (and in fact I vaguely remember writing an adventure game with that function). However, as I look deeper into this (namely by reading the Wikipedia articles), it seems as if both types of games evolved concurrently - the difference was that the original adventure games involved solving puzzles where as the original adventure games involved you exploring a dungeon, killing monsters, and collecting treasure. In fact the original adventure games were little more than a slightly more sophisticated form of arcade game. Also, they tended to rely more upon graphics than did the original adventure games (even though the original graphical representations were ASCII, or Keyboard, graphics). I do vaguely remember seeing people playing (and even playing them myself) the original CRPGs. As I suggested they were pretty basic - you would look down upon the action and basically explore a dungeon killing monsters and collecting treasures. As the games evolved you would be able to select what type of character you wanted to play, and also purchase equipment before descending into the dungeon. However, that was basically the last time you visited the shop, because then it would become a question of endurance - how long could you survive in the dungeon before you met your untimely end. Nethack was is probably the closest that you can get to the original CRPG - in fact it probably is the original CRPG, but since it is an open source program it has been slowly, but surely, evolving over the years to what it has become today. However, as you can see, this legend, and game that was played at the dawn of the computing era, and during the golden age of computer gaming (that is the eighties), is still alive and well today. Oh, for those of you who are more technologically minded, you can even play it online. In fact there were two styles of roleplaying games that developed in this era - the first I have mentioned is where you look down on top of the dungeon, and explore it that way, and the other is where you would have a 3D experience of your surroundings. These two differing styles would form the foundations of two of the seminal CRPGs of the 80s (which I will explore shortly). The Labyrinth style initially evolved from a simple game where you had to make your way through a labyrinth - pretty basic, though the larger the labyrinth the harder it would be to reach the other side. What happened though was to add a little bit more excitement (and my first experience of such a game was on the Apple II - a computer that I never owned, but I remember seeing an ad for it in a computer magazine once) they decided to throw in a monster, and to then allow you to create a character, and equip yourself, so as to survive as long as possible. Wizardry: Okay, I did suggest that I was going to look at a couple of seminal CRPGs in a second, but I'll say a few things about Wizardry before that namely because it relates to the topic of the labyrinth CRPG, and also because I didn't actually get to play the Wizardry games until a lot later (namely because they weren't available on the Commodore 64). Also, the Wizardry franchise has been evolving continuously, and I believe that remakes still appear every so often. However it is the original versions, beginning with Proving Grounds of the Mad Overlord, than I am interested in here. The thing about Wizardry is that it took the Labyrinth style to a new level. First of all you could return to the town to rearm and recuperate. Also you began the adventure with a group as opposed to being solo. However the game simply involved you exploring a massive labyrinth on multiple levels, and you had to descend to the bottom of the labyrinth and kill the big bad guy. Mind you these early adventures were really hard, namely because if one of your characters was killed you had to lug it all the way back to town, either dump it or, if you had enough money, resurrect it, and then return to the dungeon. The deeper you went into the dungeon the more powerful items you would find (and the deadlier the encounters became), meaning that returning to the town to purchase equipment at the shop by this time was pointless - everything you had was substantially more powerful that what you could buy (and you would land up with enough gold to literally purchase the entire kingdom). Hunt the Wumpus: I'll finish this section with a rather odd CRPG - Hunt the Wumpus. This was a very basic game, but has had an enormous influence on the CRPG culture. In fact it was very hard not to find a copy of this game on any computer back in the 80s. As I mentioned it was very basic - you had to explore a labyrinth in an attempt to locate, and kill, the Wumpus, all the while avoiding either the bats, or a pit. Their locations would always be random, though you would be given hints if you approached too close to one of them. Mind you, that didn't mean it was easy because even though you would know that the bats, the pits, or the Wumpus, were in an adjoining room, you wouldn't actually know which room they were in. Okay, there were certainly a lot of CRPGs that appeared on the Commodore 64 (excluding Wizardry), however the first two that I can remember were Telegard Dungeon and the Temple of Apshai. Actually, they weren't initially created for the C64 but eventually found themselves on that platform (which was the case with many of the other early CRPGs, that is until the C64 pretty much became the standard). While I remember playing around with both games initially, Telengard Dungeon was probably the first proper CRPG that I played. Mind you, it was hard - really, really hard. In fact it was so hard that it was nigh impossible for me to last any longer than a few minutes - yet for some reason I would persevere. The other thing was that it was really easy to get lost - which was one of the main reasons that I never really lasted all that long after creating my character. The main reason that I was attracted to this game was because the rule system was based on Dungeons on Dragons, and played it often despite the fact that I would create a character, walk two steps into the dungeon and proceed to be brutally murdered by the ancient dragon that happened to be lurking near the entrance - yep the game was a lot like that - and also because it was one of the very few, if only, CRPGs that I had on my computer at the time. Mind you, CRPGs have come a very long way since the days of Telengard Dungeon, but then when I think about it it was a pretty poor example of an early CRPG, especially since some of the mainframe ones didn't result in you being killed after two or three steps. Oh, and if you're game, you can play it online. Also, if you need some assistance, here is a partially completed map (though you will probably need to fill in the blanks yourself). Temple of Apshai: This was another one of those games that I played every so often, however I really didn't like it as much as some of the others. The main reason was that you required the instructions to be able to play the game. Okay, that is probably a bit of a no brainer, however most (though not all) games should be able to played without having to look at the instructions every few minutes. Mind you, it wasn't as if the game play was all that difficult - it wasn't - it was just that when you entered a room you would have to turn to that particular part of the book to find out what was in the room. You could still play the game without the instructions, namely because everything that you would interact with in the game would be in the game (there were no hidden secrets in the descriptions), it is just that it wouldn't be anywhere near as colourful. This had more to do with the primitive nature of the game - the creators were trying to create an atmospheric game with the limited computing power that they had available. Back in these days you couldn't create dungeons with detailed graphics, they were simply walls, maybe a treasure chest, and a couple of monsters, as well as a graphic of you that you could move around the room. Also replayablity was also a problem because Temple of Apshai, unlike some of the earlier games, wasn't random. However the creators did move in a new direction with another, more user friendly, game - Gateway to Apshai. Gateway to Apshai: My brother absolutely loved this game. In fact he would spend hours on the computer playing it, and the main reason for this was that it was easy. What Gateway did was that it brought the CRPG and the action game together. Like a lot of arcade games there wasn't really much of a plot - you are an adventurer and your job was to descend as deep as possible into a dungeon without getting killed. Mind you, since you couldn't save the game at a specific point and come back to it later, you were restricted into seeing how far you could go in a single session. However as well as fighting monsters you could also collect treasures and weapons to make your character stronger. Replayability was also good because the dungeon layout would be random. Sword of Fargoal: Before I move onto the next era of CRPGs I feel that I should probably pay tribute to another early CRPG - Sword of Fargoal. In many ways this is similar to Gateway to Apshai (though I believe that it was released earlier). Once again you explore a random dungeon with the intent on seeing how deep you can go without getting killed. Like Gateway, you would fight monsters, collect gold and items (though your score is based upon how much gold you manage to collect and then deposit in the temple, which is actually an interesting concept since the original Basilicas were banks - not sure how that term came to apply to a church). 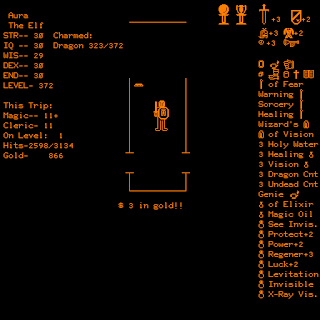 Mind you, one of the difficult things with this game was the random teleports - you could step into one and suddenly discover that you are so deep that the first monster you encounter pretty much wipes the floor with you (this was also the case with Gateway to Apshai). 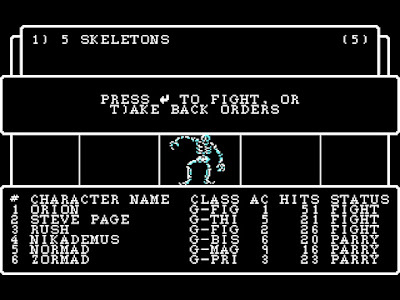 Mind you this game, and Gateway to Apshai, are still fired up occasionally on my PC because, well, despite their primitive nature they are still really fun to play. As I have suggested, in the early days of the Computer Roleplaying Game, you had two different ways that you could experience the world - from a top down perspective and from a 3D perspective. Most of the games (with the exception of maybe Labyrinth) used the top down perspective - it was much easier to produce such games than the power intensive 3d games. 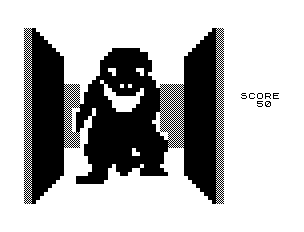 The iso-semetric games were also beginning to appear, though they were more arcade games (computing power simply wasn't that strong to be able to do anything otherwise - in fact the C64 versions of some of these iso-semetric games were limited to mono-chrome). However the CRPG was about to take another step forward with the appearance of two franchises - Bards Tale and Ultima. Since Ultima was the first of these franchises I'll begin there. Ultima Series: Actually, the Ultima series was a constantly evolving series. 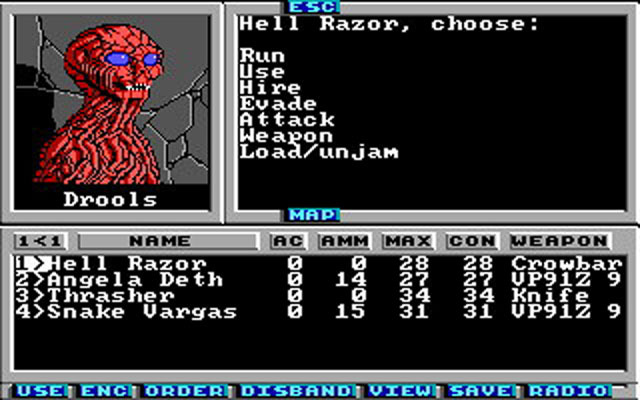 There were eight different games (with Ultima 7 appearing in two chapters) as well as a couple of side games known as Ultima Underworld. The Ultima franchise also was one of the first franchises to tap the emerging MMORPG market with Ultima Online, though that didn't appear until the late 90s. In fact there were a number of things that the Ultima series broke ground with, including Ultima IV, where the goal was not to find the big bad guy and kill them, but to become what is known as the Avatar, which meant you had to travel the game and make sure that you were a really good person, but I'll get to that in a minute. The first three Ultima games were actually a mix of the top down and 3D games. When you were wandering around outside, or in one of the towns, the game would be top down, however when you entered one of the dungeons then the game would shift to a 3D view. 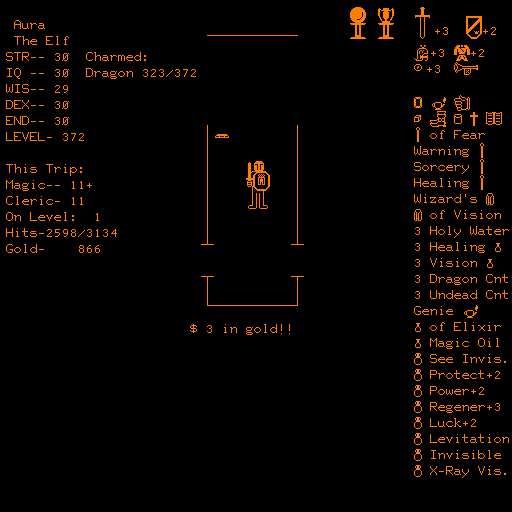 My first experience with the Ultima series was with Ultima II (but so far I have completed every one up to Ultima VI, as well as the two Ultima Underworld spin-offs). The first three simply involved building up your character (or party as in the case with Ultima III) and defeating the bad guy at the end, however as is the case the developers always looked to push the boundaries - Ultima II had you traveling across different timezones, as well as going on a space adventure, while Ultima III had you create a party of four (and the antagonist in Ultima III was actually a computer, and you didn't fight it like a normal antagonist, you had to collect cards that you inserted into the computer thus destroying it by infecting it with a virus). 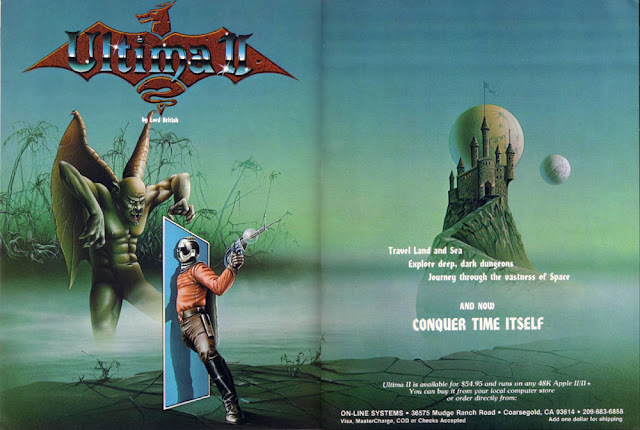 Ultima IV, however, did away with the antagonist and introduced the idea of you becoming the Avatar, a legendary figure who would unite a war ravaged land. This meant that you had to behave in a certain way. You had eight traits (including honour, compassion, valour, courage) and you had to do things that would increase your rating in each. For example you could not flee from battle as that would affect your courage, and you had to give to the poor as that would increase your compassion. Also, while you started off with your own character, you would build your party as you met certain people on your adventures (though the number of people in your party was dependent upon your virtue). 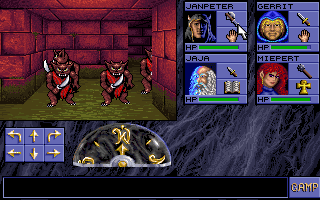 The first three Ultimas were set on different worlds (though the bulk of Ultima II was set on Earth, though in different time periods - prehistoric age, the ancient world, the modern world, and a post-apocalyptic world, as well as the time of legends, a time period that existed outside of our own time periods. However, Ultima IV and onwards was set on the world of Britannia, which was ruled by Lord Britain. Lord Britain actually appears in all of the series, though in Ultima V he has been kidnapped and it is up to you to to rescue him. 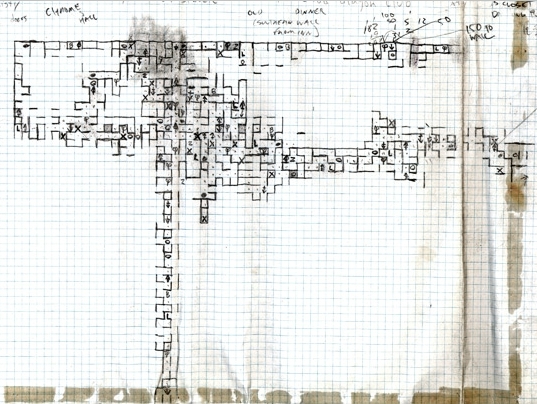 One of the interesting things in the development of the game was that in Ultima IV, when you descended to the bottom of the dungeons you would then enter a room in which you could travel to all the other dungeons. However in Ultima V this idea was expanded to become the underworld, and in Ultima VI this becomes the realm of the gargoyles (who up until that time were called demons). As I have mentioned previously, I never managed to get to anything beyond Ultima VI. Bards Tale: To be honest with you this was the roleplaying game of the late 80s that any and every Dungeons and Dragons geek had to own and play. 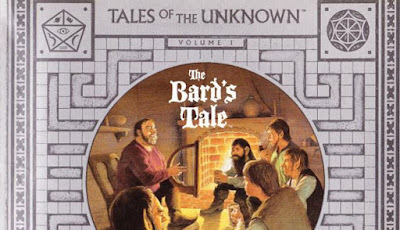 Unlike the Ultima franchise the Bards Tale, at least back then, only had three chapters (though it was revised in later years with a new, and somewhat more amusing, addition - I own a copy but have yet to get around to playing it). Like the Ultima series the Bards Tale had a plot, and a set dungeon. You would also create a party of six characters with which you would then proceed to explore the world. Bards Tale was a 3D CRPG, though most of the screen would be filled with your characters immediate need to know stats, and another window was where important information (such as the record of the combat that you had become involved in) would be displayed. The actual window on the world was a small square in the upper left hand corner. However, unlike the previous 3D CRPGs, there was more detail in the Bards Tale location (even though it would use the same pictures over and over again). The first chapter involved you exploring the city of Skara Brae, which had been taken over by a nefarious warlock. 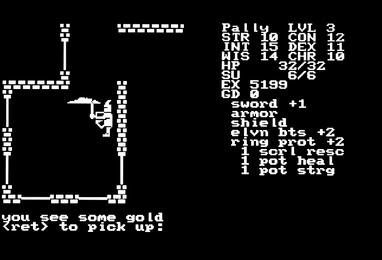 You would explore numerous dungeons (beginning with the sewers and then moving onto the crypts) to collected the items that you needed to get into the next dungeon and then finally take on the antagonist. The second chapter (which I never managed to complete) opened up the world where there were seven cities (each named after one of the cities that the Apostle Paul wrote a letter to - Corinth, Phillipi, Thessalonica, Ephesus, and Collosse - this was because the games' designer was a Christian), and each of the cities had a dungeon. The object of the game was to collect a piece of the destiny wand from each of the dungeons, and then have one of the characters, the archmage, become the Destiny Knight, and take on the bad guy at the end in what turned out to be a really interesting twist. The final installment, which I vaguely remember, had you return to Skara Brae, however it had been destroyed in an invasion from another dimension, and you were required to travel across the multi-verse in an effort to confront an evil god. I still remember playing this game, and one really annoying aspect of it. I had almost completed it - I had got to the last dungeon - when silly me then lent the game to a friend and he proceeded to get me trapped in this part of the final dungeon where there was no way out (you could only have one save game from what I remember) which meant that you had no choice but to start all over again. Might & Magic: Before I move onto the next era of computer games I probably should make mention of the Might and Magic franchise. From last count I believe that there were eight (actually there are ten, but I tuned out after number eight) incarnations of the game (and I managed to complete six of them - I was a real socialite back then). Like the Ultima franchise as the series progressed the games would become more and more sophisticated. The initial games were based on the 3D concept, however the dungeons weren't as deep as the ones in Bards Tale (only one or two levels), though this was made up by the huge world that you had to explore. The thing with Might and Magic was that every incarnation of the game would run along a similar line - you would begin in a fantasy world with swords, spears, and magic users. However, as you progressed through the game it would become increasingly clear that there was a science-fiction element to the game. In fact it would not be a true Might and Magic adventure if by the end of the game each of your characters wasn't running around with energy weapons wandering through some alien spaceship populated by robots. Mind you, the Might and Magic series were simply a series of games which followed the exact same plot with a more powerful engine - they also experimented with different concepts. For instance Might and Magic 7 (which I never got around to playing, but a friend of mine would rave about) had you playing the bad guys. Might and Magic 4 and 5 were actually one and the same game - you played the game on a disc world, and Might and Magic 4 was in one side while 5 was on the other side. However there is one thing about Might and Magic that really ended up stealing the show - the spinoffs. They had one game called Crusaders of Might and Magic which sort of run like the first person shooter, and while I did complete it, as a game it was a bit of a fizzer. However the other spin off - Heroes of Might and Magic, wasn't. Heroes, as it was colloquially known as, was a turn based strategy games that took off like a proverbial house on fire. However, since I am writing about CRPGs here, as opposed to strategy games, I will leave it at that (though writing about strategy games - actually writing about games in general, makes me want to stop writing this post, call in sick for the next two months, and spend my time playing computer games - no, not really). It wasn't going to be long before the creators of Dungeons on Dragons decided to launch their own CRPGs, Mind you, ever since the first computer nerd created the CRPG back in the 1970s, it was only a matter of time before TSR, the then publisher of Dungeons and Dragons, would release their own game. Mind you, being a long time Dungeons and Dragons dork, I would try my hand a writing an adventure based upon the Dungeons and Dragons rules. You see that was the thing with Dungeons and Dragons - by the time that they had released Pools of Radiance (the first Dungeons and Dragons CRPG), there were plenty of CRPGs around, each and every one of them as good as, or even better than, the original roleplaying game. However it wasn't a question of whether it was a CRPG, it was a question of whether it was a CRPG that used the Dungeons and Dragons rules. Back in the day I was a huge Dungeons and Dragons fan. Hey, I still am, it is just that I simply do not have the time to invest in the game anymore - which is why I am going to sell a bulk of my collection at the upcoming church fete (you got to love a church that has no problem with you selling Dungeons and Dragons products at their fete). However, like with all successful franchises, it wasn't anything particular about the game but rather the marketing of the product as a whole - come to thing of it, gameplay wise, the Ultima and Bards Tales games completely romped over the Dungeons and Dragons games. Mind you, I completed almost all of them, namely because they were Dungeons and Dragons as opposed to anything that stood out with the game in and of itself. I probably should mention a couple of other games that I fondly remember before I finish off this post (though as you can see this has already been a pretty long post as it is). The interesting this was that most of the CRPGs were all based in fantasy worlds - Science Fiction barely rated a mention. Okay, there were a couple of science fiction roleplaying games out there (including Buck Rogers, which was based on the TSR Buck Rogers Roleplaying Game). However it seemed as if the gaming community really wasn't all that interested in Science-Fiction. However that sort of changed when Wasteland hit the shelves. It was created by the people who created Bards Tale and it was immensely popular. The game was based in a post apocalyptic world and you had to wander the wasteland (which was located in Nevada) fighting mutants, and later giant robots. 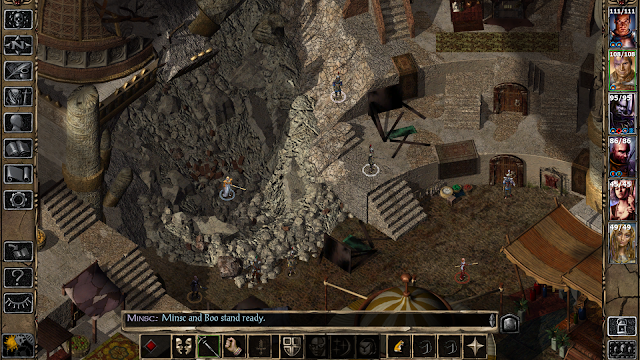 Unlike Bards Tale, the game was a top down CRPG, though the combat system was pretty much the same as that from Bards Tale. There were attempts at creating a sequel, including a really bad game called Fountain of Dreams, but other than that nothing really ever came from it, that is until the immensely popular Fallout series was born. When this game first hit the shelves many of us believed that it was actually the sequel to Wasteland - however it wasn't. Rather it simply ran on a similar theme. Due to the popularity of Fallout a sequel to Wasteland, Wasteland II, was finally released, however I am now drifting into unknown territory so I will leave it at that. As I have suggested, there where quite a few games released under the Gold Box series, which included four games in the Pools of Radiance series (Pool of Radiance, Curse of the Azure Bonds, Secret of the Silver Blades, and Pools of Darkness), and three games in the Krynn series (Champions of Krynn, Death Knights of Krynn, and Dark Queen of Krynn). However computing power had been springing ahead which meant that the creators of the Dungeons and Dragons franchise had to reinvent themselves or be left behind. At first was a series known as Eye of the Beholder, which was little more than a sophisticated maze game where you descended through a dungeon avoiding traps and killing monsters, until you met, and killed, the nasty at the end. These games were popular, but they needed something new. By this time computers had become powerful enough so that Iso-semetric games (games where you looked down on to the action from an angle) had become quite sophisticated. As such the creators of the Dungeons and Dragons games decided to go down this path - and thus came Baulder's Gates (and it's sequel, along with two Icewind Dale games). These games were much more complex, and had a lot more detail, creating a much better, and deeper, roleplaying experience. In fact the arrival of the Baulder's Gate series had effectively merged the Adventure Game with the CRPG. Honestly, I've never actually played an MMORPG (Massively Multiplayer Online Roleplaying Game), and I doubt I ever will. When we first got the internet at home I did play some strategy games on line, but after discovering that most of the world would wipe the floor with me, I ended up sticking with playing against the computer. However, the internet, especially broadband internet, brought roleplayers together in a way that hadn't happened before. Well, not really because back in the early days you did have what were known as MUDs, or multi-user dungeons, which were basically text based adventures where multiple users could play, but they weren't on the scale of, say, World of Warcraft. One of the main reasons that I never got into them was because I knew people who had effectively shut themselves away from the world playing these early MMORPG (such as Ultima Online or Everquest). The thing is that not only were these games incredibly addictive, but they effectively didn't have an end - you could simply play through these for ages, and never actually get around to doing anything else. Okay, I have to admit that I did get caught up with Neverwinter Nights for about three years, but half the reason was because of the editor - I could create my own roleplaying adventures, and pretty sophisticated ones that that. However, that is now out of my system, so I can pour all my energy elsewhere - such as this blog.